Your information says it can be configured to either go to our web site, or to our Picture-Directory Online welcome page. How do we do this? 1. 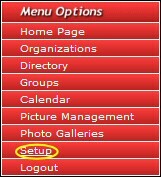 Click Setup in the menu option list in the left sidebar. 2. Click the My Organization tab in the tab area at the top. 3. 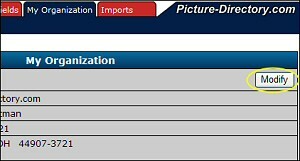 Click the Modify button on the My Organization form. Please Note:It is crucial, when you are using your website as the Home Page URL, that you include http:// ahead of your website URL. 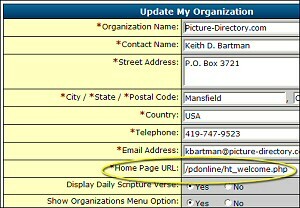 For example use http://www.myorganization.org instead of www.myorganization.org. 5. Click the Save Changes button on the My Organization form.